While policy debates between renewable or non-renewable energy still occur, the fact is that the world is riding a wave toward more and more renewable energies such as solar, wind, and biofuels. To put numbers on it, the International Energy Agency projects that 40 percent of the planet's energy will be renewable by 2040. From a global warming perspective, this shift away from fossil fuels will be crucial to our future viability. Keeping all of this in mind, let's take a moment to focus a spotlight on some of the up-and-coming companies that are leaders in renewable energy. This company is headquartered in Arizona, but, significantly, has offices around the world and generates renewable energy worldwide. It has large solar plants on six continents and even one on the small island of Samoa. The firm uses PV technology to deliver solar energy in a way that leaves the smallest carbon footprint of any method of solar power––half that of conventional solar panels. The company's website also touts the "best balance sheet in the industry." Canadian Solar is also one of the top movers and shakers in renewable energy, again specializing in solar power. It is one of the top three solar energy companies in world in terms of revenue. It acquired Recurrent Energy in 2015, which increased its overall production, or pipeline to an output of 11.1 GW (gigawatts). In 2016, Canadian Solar achieved increases in overall energy generated, a decrease in water used per MW and a decrease in the energy consumed during the process. One attention-grabbing project is Canadian Solar's help with Virunga National Park in the Democratic Republic of Congo. The park safekeeps a large percentage of the nation's endangered chimpanzees and gorillas. CS donated a grid of solar panels used to power security lights and radios, which help keep the animals from the dangers of poachers. Imagine a renewable power firm that has been around since 1898. That's Vestas Wind Systems, which operates in several countries. A seller of wind turbines, Vestas has the largest market share in the field. Vestas' installed wind capacity is now at 18GW. This German company produces ethanol and other biofuels, which are "renewable" in the sense that they come from corn (ethanol) or other plant life. Their "clean" degree is not as high as that of wind or solar, since the ethanol is burned by vehicles, but it does burn much more cleanly than fossil fuels. Crop Energies produces 1.3 million cubic meters of bioenergy annually. This Brazilian firm is the fourth largest renewable energy company in the world. Its chief form of power is hydropower, which supplies most of its overall output of 43,000 MW. The company is in the process of expanding its operations across South America, but also in Costa Rica and in the African nations of Angola and Namibia. Headquartered in Beijing, this versatile power firm is known for the technology in its name, thin film power. This technology is in the realm of solar power: thin-film solar cells are produced by laying ultrathin layers of photovaltic film atop plastic or metal. Hanergy has been applying this technology to solar panels since 2009. Before that it was a hydropower company. Its thin and light panels are very versatile, and one interesting application of them is solar-powered cars. In fact, Hanergy has a partnership with Audi through which Hanergy will develop solar cells for panoramic roofs of the car manufacturer's upcoming models. Motech, was founded in 1981 and headquartered in Taiwan City, Motech is the world's biggest manufacturer of solar energy. It engages in wide-ranged research and development in addition to actual manufacture. In 2004, long into its history of building photovaltic (PV) cells, Motech added PV inverters. 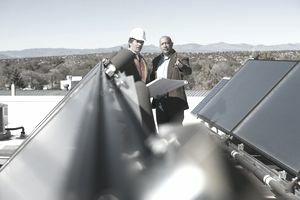 These convert from DC power into solar energy. Always innovating, and with the slogan "Modern Technology for a Sustainable World," Motech figures to be an incredible assert for Mother Earth and her inhabitants. Unlike most ethanol firms, Pacific Ethanol was founded in Southern California. Now, it does have factories around the Midwest, where the corn is, but it's a West Coast company. Pacific Ethanol was founded by Bill Jones, former Secretary of State of California. There are challenges to building solar power just as there is with any industry. The renewable energy field too often has been saddled with skepticism and pessimism, and its growth has been slowed in some countries because of unfavorable government policy. These companies, however, show how profitable––and sustainable––renewable energy can be.